There are a few different methods you can use within PayWhirl to refund customer payments or provide a customer with credit. There are a few different places within PayWhirl where you can refund payments. You can also issue discounts or credits (in the form of a gift code) instead of a refund. Inside any PAID invoice locate the "Payment Details" section and then click the refund button to initiate the refund. You can refund the total amount, which will be pre-filled by default, or you can enter a partial amount. If you issue a partial refund, the amount will be recorded in the payment details section of the invoice along with a refund reference ID provided by your gateway. You can also issue refunds from the payments page within PayWhirl if you click "View" on the payment to see the payment details page. Simply click "Refund" in the top right corner of the payment details page to complete the refund. You can also credit customers by adding a NEGATIVE fee line item to an upcoming invoice. Negative fees will work as a credit for that invoice only. You can also issue a gift code to the customer to work as store credit. This will be applied before the customer's payment method is charged for any future invoices. If the amount of the credit is more than the invoice, the remainder will stay on the customer's account as a balance until it is all used up. Select the customer and enter the amount for the credit. If you use this option, you may want to create a custom email template to let the customer know this was a credit, not a gift. 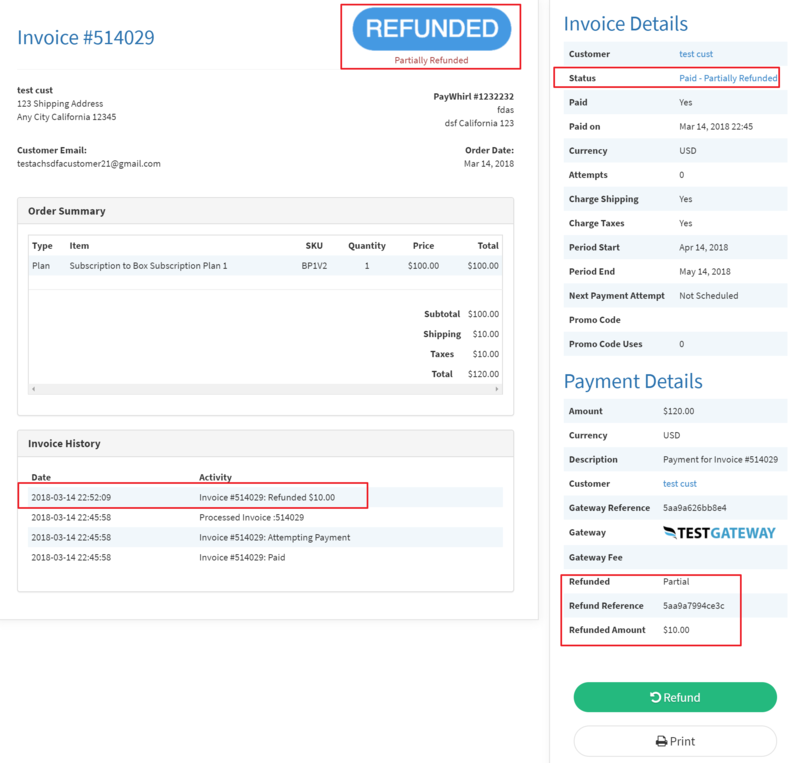 Refunds directly from the Gateway - (Not Recommended) You can also refund payments directly in the gateway but they won't automatically show up in PayWhirl. This is mainly used only if the invoice is no longer in PayWhirl (the payment gateway was removed).